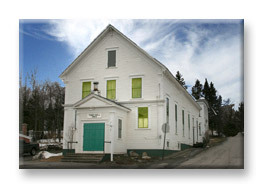 The Pittsburg Historical Society was formed in early 1982 and meets at the Town Hall Historical Museum. The Historical Society meets on the fourth Wednesday of the month. 6:30 p.m. business meeting followed at 7:00 p.m. with presentations from June through September at the Town Hall Museum on Main Street. All are welcome to attend. There are monthly programs on a variety of topics of local interest, and you do not need to be a member to attend. Membership in the Society is only $5.00 a year for individuals and $10 a year for families. If you have an interest in history, you will enjoy attending our meetings. Also open 1-3 pm on Old Home Day and Moose Festival. If you see the flag flying outside the building the museum is open, please stop in.